Since Setting-up this website in November of 2005, I've received many e-mails from people interested in the Quickie designs. I do not claim to posses the ultimate and final answers to anyone's questions, so I respect and rely upon the experience and knowledge of other builders and enthusiasts to help me out. As always, especially in experimental aviation, the buyer/builder has the final say as to the safety of his or her own airplane, and the application of any answer given. Therefore always remember that your mileage WILL vary. What is the name of the company that produced Quickies? How many variants of the Quickie are there? How do I tell the difference? How do I know what I saw (or bought)? How many Quickies were sold? What are the average cruise speeds of the various Quickie models? How many seats are in a Quickie? What materials are used in the construction of Quickies? What is a canard and why would you want one? Why is there a wing in the front and no horizontal stabilizer in the back? Is there a tricycle version of the Q2/Q200? What engines are used to power Quickies? Where can I go for help in building a Quickie? Are there any fly-ins specifically for Quickies? Can you still find kits for Quickies? Is there a web site for Quickies? Is there a newsletter for Quickies? What are the LS1 and GU designations? What is a belly board? What are the specifications for a Q2? What are the specifications for the Q200? What are the control limits on a Q2/Q200 with an LS1 canard? What was the CG range developed by Quickie Aircraft Corp. for the LS1 canard on the Q2/Q200? What are the specifications for the Tri-Q? Can I build a Single Seat Quickie from scratch, using only the plans sold here on this site?? Can I build a Q2/Q-200/Tri-Q from scratch, using only the plans sold here on this site? Can I build this in my garage/house or do I have to build it at the airport? How can I tell if I have a GU or an LS1 canard? What is the progression of control when taking off in a Quickie? Q: What is the name of the company that produced Quickies? A: company called Quickie Aircraft Corporation (QAC) started selling plans and kits for the original single place Quickie in late 1979 after winning the "Best New Design" award at Oskosh (Airventure) that year. In 1982 they produced and sold kits for the two seat version called the Q2. 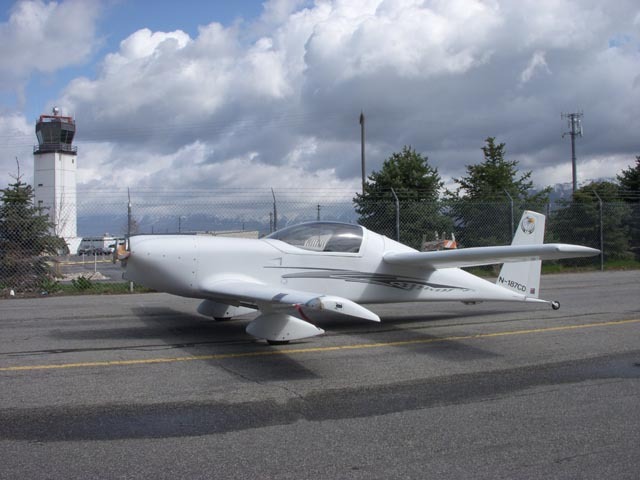 In 1984 QAC upgraded the two seat version with a new canard airfoil and Continental O-200 engine and called it the Q-200. The company went bankrupt in 1986 while defending themselves in a lawsuit filed by a builder who was injured in a Single Seat Quickie accident. The kits are no longer manufactured by QAC, but they are still actively supported by an active group of fellow builders and flyers that formed the Quickie Builders Association (QBA) in 1982. QBA has continually published a bi-monthly newsletter since it was formed. Q: How many variants of the Quickie are there? A: There are 4 major variants of the Quickie design: Quickie (single seat), Q2 (two seater with GU Airfoil Canard and Revmaster (VW) engine), Q-200 (two seater with LS1 Airfoil Canard and Continental O-200 engine), and Tri-Q (two seater with tricycle landing gear). Within the 4 major variants, there are many sub variants due to differences in engines, and the airfoil of the front wing (canard). Q: How do I tell the difference? How do I know what I saw (or bought)? A: Typically if you see a tandem wing airplane with only a single seat, it is a Quickie. 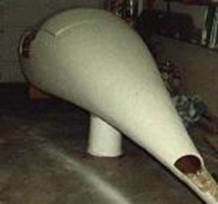 The original GU canard was prone to lose lift in rain, or with bug contamination, due to it's "laminar flow" design. Quickie Aircraft Corporation (QAC) addressed this issue by telling builders to install "vortex generators" (small vertical tabs) along the span of their canards to maintain the smooth flow of air over the canard when contaminated. Later QAC approved an improved canard airfoil called the LS1. The LS1 airfoil has less critical building tolerances, and is not prone to lose lift during rain or bug contamination. However, an aerodynamic "sparrow strainer" is required on the trailing edge of the canrd to reduce stick forces during flight. This is an Onan powered Single Seat Quickie with the original GU canard. The Success of the Single Seat Quickie brought competition. 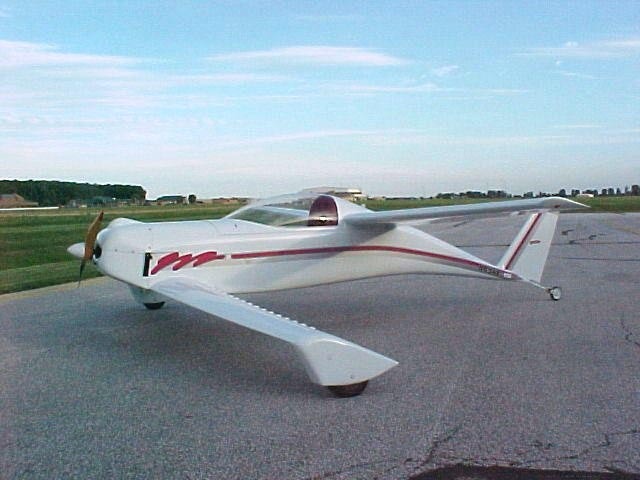 In 1981, Viking Aircraft beat QAC to the punch and introduced a Two Seat Tandem Wing design based on the Quickie. They dubbed their creation the "Dragonfly." There was a bit of a rivalry between Quickie and Dragonfly builders in the early days. But over the years we have formed a tight bond, and host several fly-ins per year, with our Dragonfly brethren. However, a Dragonfly is NOT a Quickie. The Dragonfly is "plans built" meaning that the builders needed to fabricate almost all of their own parts. 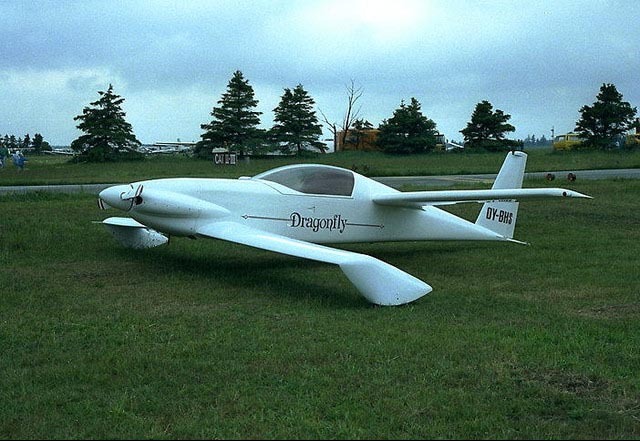 Unlike the Q2, the Dragonfly has flat surfaces on its fuselage, and the wings are detachable for trailering. This is a Two Seat Dragonfly MKII - The MKII denotes the landing gear being moved inboard to help with ground handling. Q: How many Quickies were sold? A: About 1000 sets of plans and kits were sold for the single seat Quickie and about 2000 kits were sold for the two place Q2 and later the Q200. Q: What are the average cruise speeds of the various Quickie models? A: Single place Quickies with an 18 hp Onan motor can cruise at over 110 mph. Two place Q2s with a 65 hp VW engine can cruise at over 140 mph. Two place Q200s with a 100 hp Continental O-200 (from a Cessna 150) can cruise at over 180 mph. Q: How many seats are in a Quickie? A: The original Quickie has one seat. The Q2 and Q200 has two seats side by side. Q: What materials are used in the construction of Quickies? A: Quickies are primarily made out of foam, fiberglass and epoxy. There are also welded steel parts, aluminum parts and some wood. A: The Quickie Aircraft Corporation quoted about 500 hours, but 2000 to 3000 is more realistic. Prior experience can help reduce the number of hours needed. Given the demands of current lifestyles, five years of construction should be considered as a minimum. Q: Are Quickies a biplane? A: Yes and no. The Quickie design does use two large flying surfaces much like a biplane, but the wing in front is actually called a canard. The canard produces approximately 60% of the lift for Quickies but it also helps control the pitch of the aircraft by incorporating elevators at the aft surface of the canard. Q: What is a canard and why would you want one? A: Canards go back to the first powered flight done by the Wright brothers. Aerodynamically, the canard in a Quickie is designed to stall before the main wing when the nose is pointed too high. By stalling first, the canard causes the nose to drop down and the plane recovers on its own before the main wing stalls. This is a major safety feature of the Quickie design. Q: Why is there a wing in the front and no horizontal stabilizer in the back? A: The forward flying surface, called the canard, has a dual function. It produces approximately 60% of the lift in this aircraft but it also has control surfaces built into the rear portion designed to give the pilot the up and down pitch control usually provided by a horizontal stabilizer. Having both would be redundant. Q: Is there a tricycle version of a Q2/Q200? A: Yes, Scott Swing, who formerly worked at the Quickie Aircraft Corporation, designed a fiberglass main gear and a steel nose gear arrangement for Q2 and Q200s. The Tri-Q kits are still available. Q: What engines are used to power Quickies? A: The single place Quickie was designed for the 18 hp Onan generator motor. Later improvements made 20 hp and 22 hp Onans available. Single place Quickies have also been flown with Rotax 503 and 1/2 VW engines. Q2's were designed to use the 65 hp 2100D Revmaster VW engine popular in the early '80s. This engine was later modified to deliver 75 hp. Q200's were designed for the 100 hp Continental O200 which are usually found in the much slower Cessna 150. Several builders are working on alternative engines including the Mazda Rotary, Subaru EA-81, Subaru EJ22 Legacy, Rotax 912, and Corvair engines. Q: Where can I go for help in building a Quickie? A: There are hundreds of builders throughout the US and around the world who could offer help in answering your questions. The Quickie Builders Association grew from this group of experienced builders. The Q-Talk newsletter allows its members to share ideas and to help one another through the building and flying process. Q: Are there any fly-ins specifically for Quickies? Q: Can you still find kits for Quickies? A: There are still many kits available in all stages of construction from still in the box to "ready to paint." A: Quickies and Q2/Q200's are kit built airplanes. You need to find a project to build one. There are many projects out there from never started to almost ready to fly. Q: Is there a web site for Quickies? Q: Is there a newsletter for Quickies? A: Yes, it is called Q-Talk. Q-Talk was first published in 1982 and continues to provide building tips and information to fellow Quickie builders. It can help reduce construction time while still building a safe and fun plane to fly. Q: Can I build a Single Seat Quickie from scratch, using only the plans sold here on this site? Q: Can I build a Q2/Q-200/Tri-Q from scratch, using only the plans sold here on this site? A: Maybe? The plans for sale here on the QBA website were originally distributed with the kits supplied by Quickie Aircraft Corporation. The Single Seat Quickie (Q1) plans contain all of the details necessary to construct the fuselage from scratch. They are also posted online here for FREE so that you can preview the instructions and see if YOU feel it is something you are capable of building. The Q2 kits came with the fuselage pre-molded. The fuselage for the Q2 is the same for the Q2, Q-200, and Tri-Q. It would be difficult to build a fuselage from scratch using only the plans, and large templates as a guide. I do not know YOU and your level of resourcefulness . . . However, I am aware of one builder (Brad Baer) who successfully built a Q2 fuselage from scratch using nothing but the plans, and large templates. The large template sheets contain fuselage jigging templates for supporting the fuselage during construction. The large template sheets also contain outlines of all of the major bulkheads. The plans and templates also indicate where those jigs, and bulkheads should be placed, via numbers called Fuselage Stations, or FS numbers expressed in inches from a common starting point. (For example, the firewall bulkhead is at Fuselage Station 14 (FS14) meaning that it is 14 inches behind the tip of the spinner. Brad laid out the fuselage jigging templates, and ran stringers between them. He then laid foam in the newly created form and glassed over it. In this manner he was able to finish the bottom of the fuselage. For the top, he used the bulkhead templates as a guide, and again foamed and glassed them into place. Brad documented this work at www.mykitplane.com but that website has since been taken down. The thumbnail photos remain in the internet archive here. Q: Can I build this in my garage/house or do I have to build it at the airport? A: The intial building should be done in a workshop area you have good access to and heat if you live in a cold area of the country. You only need to take the plane to the airport right before you are ready to be inspected and fly. You transport your plane on a trailer. The design includes a split line in the fuselage behind the main wing so you can remove the tail for transport. Q: What are the LS1 and GU designations? A: The original design of the Quickie used one of the GU airfoils for the canard. Rain and bug contamination led to lift problems with that airfoil. The LS1 airfoil was introduced along with the Q200 version to help support the higher weight and not be so sensitive to leading edge contamination. Q: What is a belly board? A: Quickies do not include a flap control, so an air brake that is nothing more than a flat surface that is extended below the fuselage was introduced to provide much the same over-the-nose visiblity you would get with a typical flap. Q: What are the specifications for a Q2? A: (per Quickie Aircraft Corporation - Your milage may differ) Wingspan: 16' 8"
Horsepower: 64 h.p. @ 3200 r.p.m. Q: What are the specifications for the Q200? A: (per Quickie Aircraft Corporation - your milage may vary) Length: 19' 10"
Total wing area: 67 sq. ft.
Baggage capacity: 40 lbs. / 5 cu. ft.
Q: What are the specifications for the Tri-Q2? A: Quickie Aircraft Corporation did not publish official performance specifications for the Tri-Q2 before they went out of business. However, several Tri-Q2's are currently flying with very good results. Q: How can I tell if I have a GU or an LS1 canard? A: The GU and LS1 are very distinctive when you look for a couple of things. The GU is fairly pointed on the leading edge and almost flat on the underside fore to aft including the elevator. The LS1 has a rather blunt leading edge compared to the GU and the underside also has a very definite concave portion that begins aft of the fore to aft midpoint and continues through on to the elevator. Another way of say this is if you flipped the canard upside down, an LS1 would appear as though someone carved a very shallow trough in the aft half of the canard. The GU would appear almost flat fore to aft on that bottom surface. Q: What are the control limits on a Q2/Q200 with an LS1 canard? 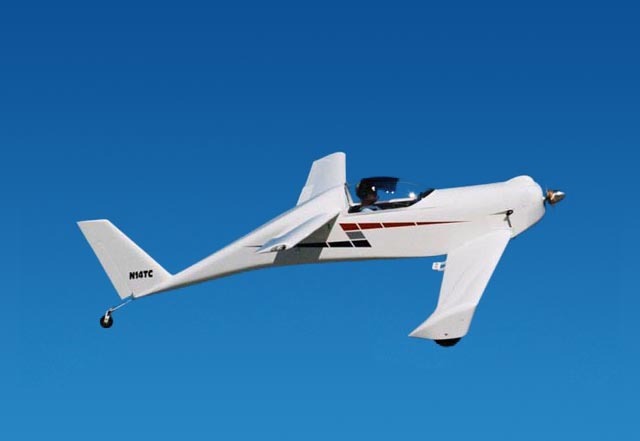 Q: What was the CG range developed by Quickie Aircraft Corp. for the LS1 canard on the Q2/Q200? 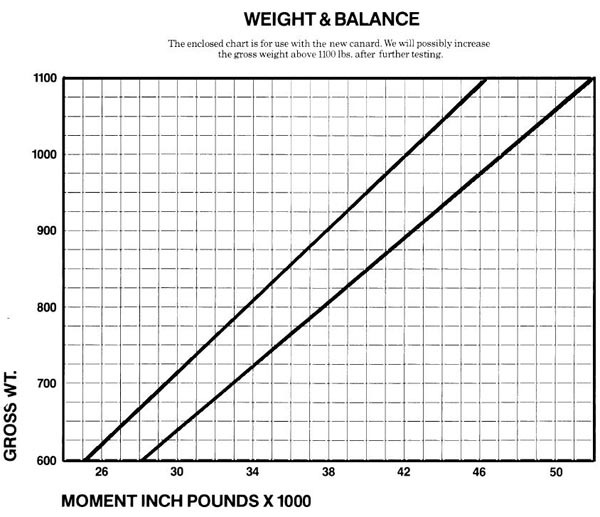 A: View the graph below. Q: What is the progression of control when taking off in a Quickie? ----climb at safe speed and rate.